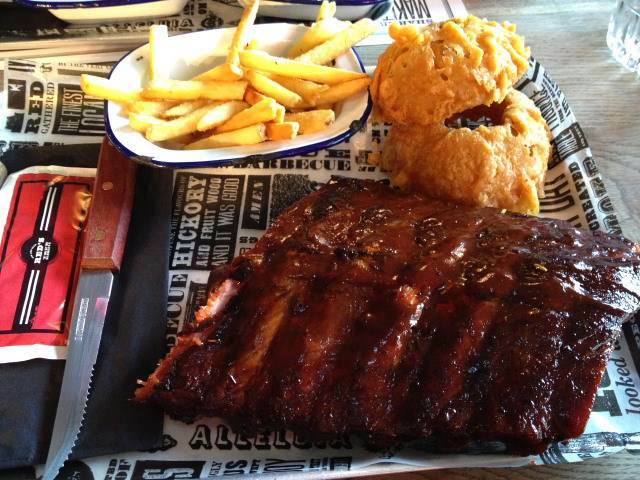 When did slow-cooked barbecued ribs become the unofficial signature dish for the whole of Leeds? I don’t know, but I’m not complaining, and even though I exaggerate slightly, there do seem to be loads of rib joints springing up all over the city. This one, Red’s True Barbecue, is the current, undisputed leader of the pack. Red’s has developed a sort of semi-religious following over the last few months. People speak of it in slightly awed, often hushed tones, of the smoke and the food, and the impossibility of getting a table. It’s hammed up by the restaurant itself, with clever marketing encouraging ‘belief’ and devotion. Their irreverent take on the creation story made me smile. Red’s is a huge slice of Americana beamed down into the middle of Leeds. It sits on a busy corner near the Corn Exchange, red neon signs shining into the dull street outside – bold, brash, confident, but homely and welcoming. Big food served with big smiles. The menu is essentially an awful lot of very slow cooked meat, smothered in barbecue sauces of various types and finished over flames. My ribs were tender, tasty, the meat falling away easily from the bone … not the usual gnawing struggle. These were ribs from a well-looked after pig – the amount of meat and the thickness of the bone made that obvious. There’s little point putting meat at the centre of a menu unless it’s the absolute best, and this was just that. The same goes for the way in which that meat was cooked. Good meat deserves a careful hand, and 14 hours of long, slow cooking showed in a bowl of Carolina pulled pork, served with apple sauce and the freshest, tangiest coleslaw this side of, well, Carolina. The meat was disintegrating and sweet, the soft fibres of pork the exact opposite of the crisp, crunchy crackling tumbling over the top of it. Even the kid’s menu is in a different class, essentially scaled down versions of the same with healthy doses of salad and that crunchy coleslaw. Barbecued corn on the cob seemed to disappear impressively quickly. This visit really took some doing, and I’m glad we persevered. Three previous attempts to get a table left us faced with anywhere up to a two and a half hour wait. The last time, the waiter on the desk looked at our tired and hungry kids and just said “they’re not going to last are they?”, which I had to agree with, all the more cruel having conducted the conversation within sight and smell of a raging, smoking grill. It’s a difficult problem, but a good one – open up a new restaurant, somewhere that seems to hit the zeitgeist, and see it packed out every day, all the time. Running a strict booking system seems a little out of step with the relaxed image, but not having a booking system makes getting a table a very unpredictable state of affairs, which doesn’t lend itself to planning a night out. This seems to trouble Red’s – there’s a great post on their blog explaining why they run the system they do, and, on balance, it probably is the fairest way of going about things, and it clearly isn’t hitting business. Just go early, get on the list, have a drink somewhere else and wait for them to give you a call when your table is free … it’s a civilised way of queuing in a restaurant, and there are no shortage of very good bars nearby to wile away an hour or so. Don’t wear a white shirt. Good to see you finally got into the reds church are you a convert?